Originally, I had planned on writing something else today. I was going to discuss that crock of a “bipartisan group” to fix I-270, formed 48 days before an election. But let’s be honest, everyone can see through that charade. I wanted to talk about something more important. Something that has been happening with increased regularity in our society. An injustice that seems to happen every week. Here’s the cliff notes for you. Man’s car breaks down. Someone calls 911 saying there is a car blocking the road. Police are dispatched. Man is killed or murdered, depending on your political paradigm. There’s footage of the entire incident. You can watch it and decide for yourself. Hell, there’s even helicopter footage of the incident! What freaking police department can afford helicopter reconnaissance over a traffic stop?!?! But let’s get to my point. I want to share something with you. A few weeks ago I was cleaning out part of my basement and I came across my Army Memorabilia Bag. Every veteran has one, usually full of awards, challenge coins, and random trinkets. This is one of my random trinkets. 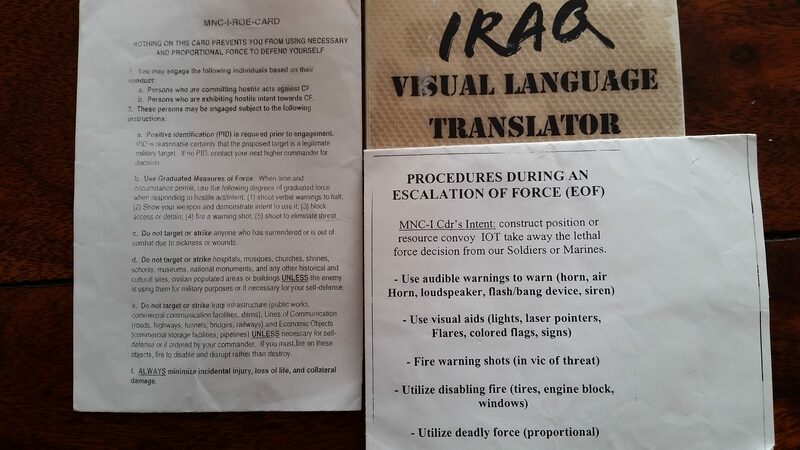 I carried this around in Iraq, it was a mandatory item to keep on your person. Included in this pouch of mine were other things like my DA From 1156, Casualty Feeder Card. Talk about morbid, we had to fill those out for ourselves and keep them in our pocket, just in case. b. Person who are exhibiting hostile intent towards CF. A hostile act would be firing a rifle at someone. Hostile intent would be something like digging a hole on the side of a supply route to a military base. Use Graduated Measures of Force. When time and circumstances permit, use the following degrees of graduated force when responding to hostile act/intent: (1) shout verbal warnings to halt; (2) Show your weapon and demonstrate intent to use it; (3) block access or detain; (4) Fire a warning shot; (5) shoot to eliminate threat. So here’s a scenario for you. A person is walking down a road with an AK-47 slung over their back. How would I have responded in Iraq? Well, having a weapon in a warzone is not considered a hostile act or hostile intent. So I just keep an eye on them. Generally, they wave and say “As-salamu alaykum,” which is an Arabic greeting. Literally, this scenario happened every day I was on tower guard. A person walked by my tower with a firearm and said “Peace be upon you.” Did I get scared and shoot them? No. Did I roll out the Apache’s and blow them away? No. Because it was not my job to run around murdering civilians because I was afraid. Every time I read one of these stories of another person being murder-death-killed by the police, I watch the video. I look to see if I would have taken the shot like they did. I’ve said it many times before, police officers in the United States have more leniency to shoot a US citizen than I had to shoot an Iraqi civilian during a war. Here’s your proof, as you can see from the Rules of Engagement and Escalation of Force that I followed. It is harder for a soldier to shoot a belligerent in a war zone than it is for a police officer to shoot a US citizen. So why am I tired of these stories? Because without hesitation, Republicans will leap to the defense of the police officer. Without even watching the video, they’ll say “s/he deserved it, they are a thug.” The officer involved in these incidents is rarely charged with a crime, and even more rare is a guilty verdict. This status quo is not going to change as long as large groups of people automatically defend these criminals with a badge. There are good cops and bad cops. We all know this. But there’s a missing category, cops that should not be cops. People who are too nervous, scared, or do not have the ability to perform under stress. In my humble and irrelevant opinion, it is the 3rd type that commits these acts. Perhaps the police academy does not instill enough discipline to create effective officers. Perhaps the training is forgotten over time. Or perhaps the screening procedures are not up to snuff. Whatever the cause of the problems may be, this attitude within police departments and Republican circles needs to end.